We fit many different types of contacts, including soft and rigid contacts, contacts for astigmatism, multifocal or bifocal lenses, and specialty lenses like scleral lenses. We do our best to find the best solution for your specific vision needs. If you have been told in the past that you cannot wear contact lenses, please do not let that discourage you from asking if there is now something available for you. The newest type of soft contact lenses are made from material called silicone hydrogel. These contacts allow six times more oxygen to access the eye during wear, which is necessary since the front of the eye has no blood supply to receive oxygen from. 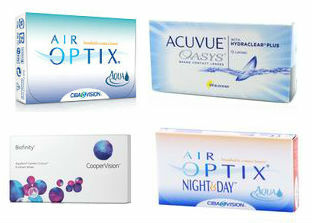 We carry trials of many brands, including Biofinity, Acuvue Oasys, Air Optix and Air Optix Night and Day, as well as contact lenses for astigmatism. If we do not have your specific prescription in our trials, or you need something we do not carry, we are able to special order trials. Most of today’s soft contact lenses are designed to be replaced monthly, and should be cleaned nightly to remove deposits like proteins, lipids, and bacteria that build up during the day. Some special brands are approved for wearing overnight. 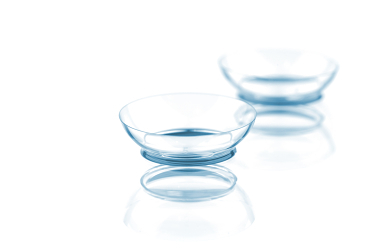 There are also daily-disposable types that allow patients to experience a fresh lens every day. Adhering to the replacement schedule recommended by our doctors will help lead to more comfortable, healthier contact lens experience that prevents complications such as decreased lens wearing time or infections. Financing is available in our optical shop for glasses purchases through Care Credit.